A compact and durable design that delivers fast speed, a high duty cycle, and low total cost of ownership for exceptional value The B4600 Series from OKI is built for efficiency and speed, with expandability to meet your future needs. If you're looking to improve the productivity and lower the operating costs of your business, B4600 Series Digital Monochrome printers are made for you. All models in the series deliver up to 27 ppm, with the first page printing in as little as 5.0 seconds. They produce black & white output that's clear and crisp in 600 x 2400 dpi resolution, using a two-piece consumables system for long-lasting, high-quality performance and a low cost of operation.For fewer user interventions, each has a 250-sheet standard paper capacity housed in a fully enclosed Letter/Legal/Universal tray, and can be outfitted to hold up to 750 sheets with an optional 500-sheet 2nd paper tray.In terms of durability, B4600 Series printers are tough-with a monthly duty cycle of 40,000 pages. Fit for any work environment. 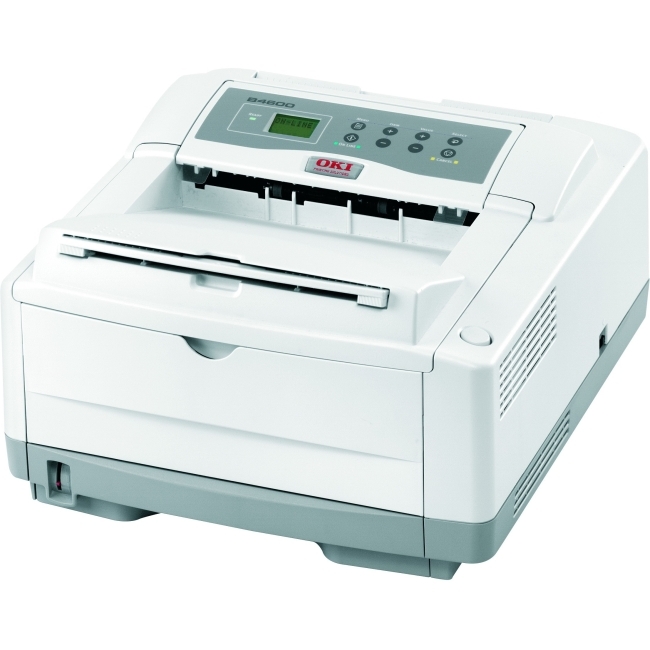 B4600 Series printers, with their compact size, stylish lines and color choices Beige or Black-fit just about anywhere. All have PCL®5e and PCL 6 emulation, and the B4600n PS model has PostScript®3™ emulation standard. With USB and parallel interfaces, all B4600 Series printers offer broad-based connectivity. And, equipped with an OkiLAN® print server, these printers make network printing affordable-which translates into a much lower cost per user, a vital consideration as your office network grows and expands in functionality. Backed by unmatched support. OKI is so confident in the reliability and performance of the B4600 Series that we provide an industry-leading 5-year printhead warranty and a 1-year limited Carry-in Depot printer warranty.